I just got back from the my studio. 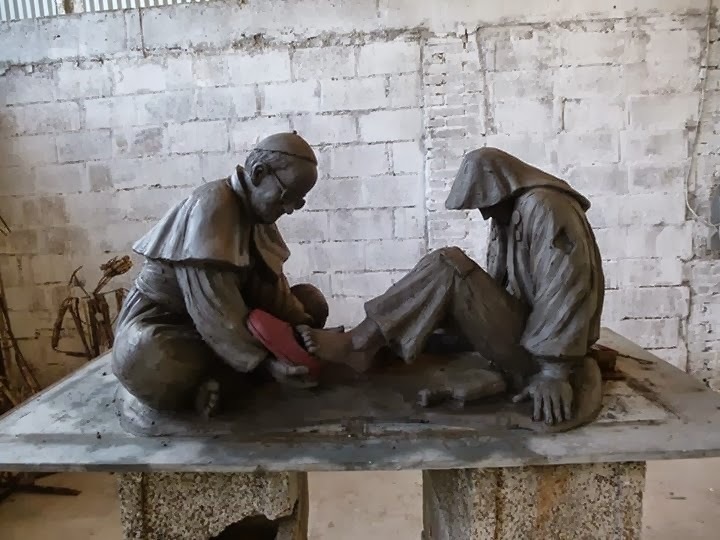 Finished a sculpture of Pope Francis putting the red papal shoes on a homeless person. I have had this idea for several months. the idea is very symbolic and although the scene never happened in reality, (the new Pope does not even wear the red shoe traditionally worn by popes for centuries), In spirit the scene is happening daily with the new Pope. I started this work after I heard that Pope Francis saw a coloured wax museum statue of himself outside a cathedral in Latin America and demanded its removal. He stated he does not want that type of idolatry. this work is an icon of his message, not necessarily of himself, I wonder if he would approve. Certainly He is not anti- art and must know that the significance of himself will not go unnoticed by the artist. I like how the sculpture conveys who the pope is through his gesture. I know that Pope Francis is a humble man. If he had made this sculpture, he would have made the homeless man more prominent and he would have been more in the background. This is a piece for the ages.